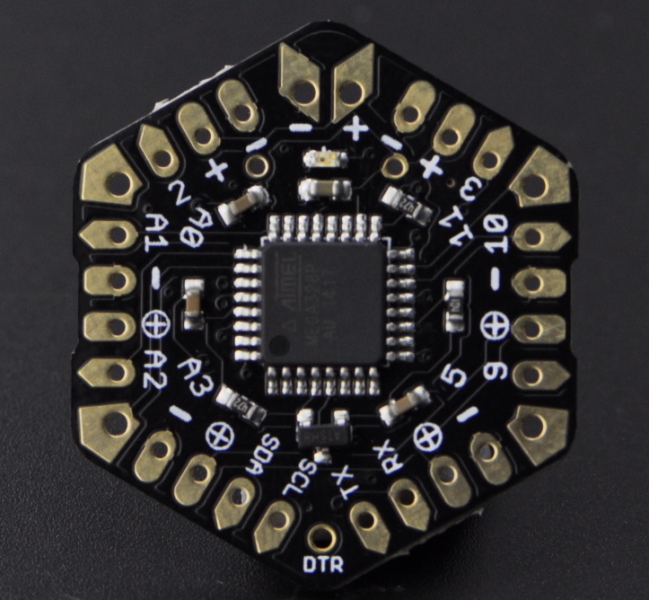 μHex is the first low-power controller which is compatible with Arduino. It is very suitable for the battery power supply environment. A 210mAh CR2032 cell battery can support it standing by 60 days with using PIR sensor (SEN0171) as a trigger. As it is using Atmega 328 Microcontroller, it has good general and powerful performance. It has 14 GPIO and 7 power ports (4 of them could be controlled) which could meet most of your project. Please don't update the bootloader since it is different from the Arduino Pro or Pro Mini one. Please connect an external power supply, if you want to make some large current application such as servo control. Please download the Arduino library microPoly Library first. Function: The uHex is in sleep state until pin2=LOW and pin3=HIGH. 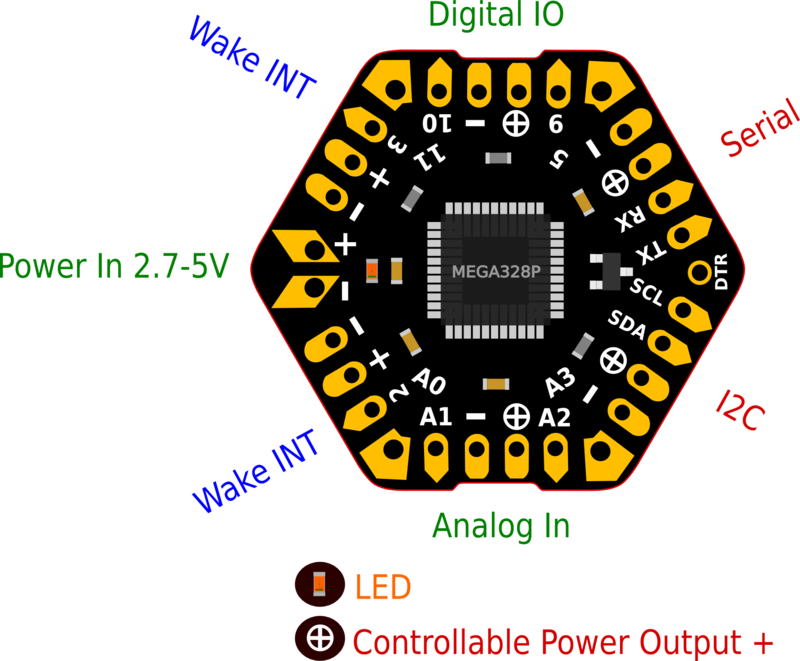 Once waked, the LED on the board will flash for some seconds and then go to sleep again. Function：The uHex is waked by period timer (using watchdog timer). Once waked, the LED on the board will flash for some seconds and then go to sleep again. The uHex sample data every 1 minute. If button is pressed the average data will be display on the LCD screen. After some seconds, it will go to sleep again. In the scope of uHex ports, the program from Arduino UNO/Pro Mini can be run on the uHex. A It is Chinese word '茶 cha' meaning 'Tea '. 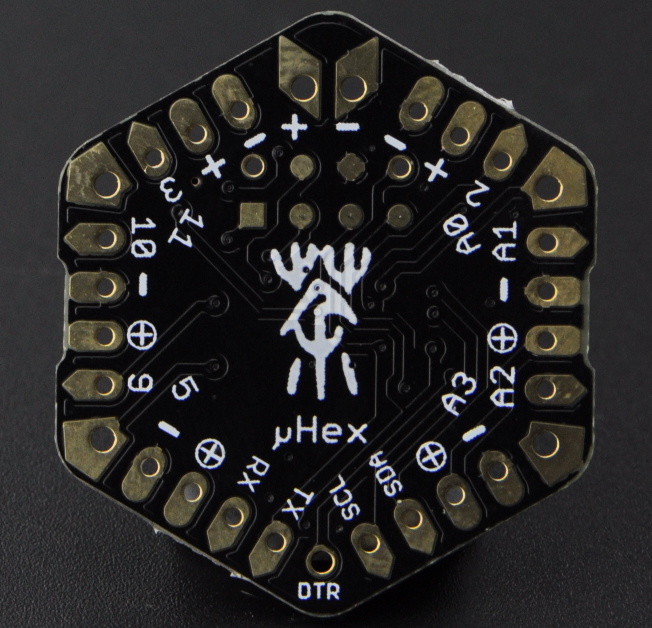 A uHex is designed in the Chinese New Year. During the fesitival, people hang '福Fu' upside down on the door that mean blessing arriving at your home. Here I use the '2' stand for Fu. Fu means happiness. Q Why I can't see any crystal oscillator on the module? A uHex is using built-in 8M RC resource and completely meets the demands of general application. Get it from UHex Low-power Controller or DFRobot Distributor.